Facebook on Monday rolled out a WhatsApp update that could threaten Snapchat’s share of the mobile app messaging market. The update allows WhatsApp users to share photos and videos through the app’s status area. Moreover, like WhatsApp text messages, content shared through status updates is protected by end-to-end encryption. End-to-end encryption is a key distinction between WhatsApp and its competitors, noted Charles King, principal analyst at Pund-IT. “That’s an important point for people sharing private messages with individuals and groups, and is one reason for WhatsApp’s widespread global success,” he told TechNewsWorld. Photos, GIFs and videos can be overlaid with drawings, emojis and a caption, and now can be shared via status for 24 hours before disappearing. The change in the app is a fundamental one. WhatsApp previously had been exclusively for texting. Now its users will be able to scroll through rich content. The status upgrade won’t replace the way a user’s status is displayed by name in the app. A tab with a plus sign will be added to the interface. Tapping the plus sign will take you to the WhatsApp camera, and tapping that will take you to the rich content posted by your friends and family. 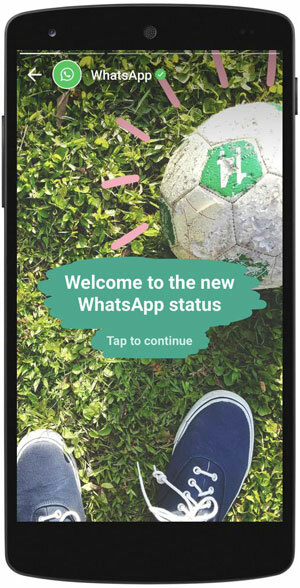 This latest update of WhatsApp is another example of Facebook playing catchup with Snapchat, as it did last summer when it introduced Instagram Stories, a shameless knockoff of Snapchat’s Stories feature, introduced in 2013. “This is not only Facebook playing catchup with Snapchat, but probably burying Snapchat,” said John Carroll, a mass communications professor at Boston University. Snapchat felt the sting of competition last year, when Facebook introduced Instagram Stories. Since then, Snapchat’s Stories feature has taken a significant hit, according to TechCrunch, which reported that from August, when Instagram Stories was introduced, to mid-January, Snapchat Stories views declined 20-30 percent. Meanwhile, Instagram Stories usage soared during that period to 150 million daily users, or about the same number of users Snapchat has for its entire app. Facebook’s competitive strategy toward Snapchat has shifted in the last six months, Pund-IT’s King observed. However, this latest attack on Snapchat’s turf need not be a zero sum game, maintained Jessica Liu, a senior analyst at Forrester Research. “If one social networks wins, it doesn’t mean that the others automatically lose,” she told TechNewsWorld. By user numbers alone, Snapchat doesn’t seem to be much of a threat to Facebook’s holdings, but user numbers alone may not tell the whole story. Snapchat’s parent company, Snap, is planning an IPO next month, and it expects to raise more than US$2 billion. “That will fill its coffers to boost its R&D and marketing efforts, which could pose a significant threat to Facebook,” said Andreas Scherer, managing partner at Salto Partners. The proceeds from the IPO also could be used to expand Snapchat’s market reach. Snapchat has shown itself to be considerably more inventive and innovative than Facebook, King noted.